I’m pretty new to the one-piece swimwear trend… last year was the first time I fully embraced it. I’m heading to Croatia and Cali this spring and have been on the hunt for a few more. But because I live in New England, my attitude about swimwear has always been to avoid spending too much $ on them. They only get so much use around here, so in my opinion, it’s not worth it unless I find one that has the most incredible fit, great quality and a timeless style. Green Palm Print: I love this print – it’s exactly what I had in mind when I started my one-piece hunt. This one also comes in under $30, so it’s a steal. It has a low scoop back with fun detailing – and while I do love this, I’ve found that this style isn’t the best option for my body type. Because this is from the Xhilaration line, I recommend sizing up (I got a medium but probably could have used a large). Black/White Striped with Lace: I was skeptical about the fit of this one but went ahead and ordered after seeing lots of positive reviews… one person said they even went back for the black version with white lace. It reminds me of THIS more expensive version that I had my eye on last year, and I like that it has a tie in the back that allows you to adjust the tightness at your waist. There’s a very similar style from the Sea Angel line that comes in black and navy and you can also grab it in maternity sizing in both solids and prints here, here & here. Pink Floral/Tropical: This is probably my favorite out of the bunch when it comes to the print – and I also like the Tori Praver line because I know they’re high quality for the price. If you’re looking at someone wearing this one from the back, it looks like they’re wearing a two-piece bikini. The medium fit well, but I ultimately decided not to keep this one in favor of others, mainly because I didn’t think the low back was super flattering on me. It also comes in this fun floral print and this bright tropical print. Scalloped Black Floral: This option from the Vanilla Beach line is a pretty simple, low-back one-piece – but it has fun scalloped details that make it super flattering. If you’re looking for a solid color, it also comes in black, and here is another floral print option. I like that it has adjustable straps and the cut is a bit cheeky. Also got a medium in this one. Green Floral/Birds of Paradise: Another Tori Praver one-piece, this is in the running for my favorite this season. It can be worn/tied in two different ways and has a slight cutout on the sides. The bottom of it is cheeky, but also comes up the perfect amount so that you feel nice and sucked in in the right places. The medium was right for me on this one as well. Gingham & Black: This is such a classic cut and I love that it has gingham on top (also available in stripes, solid black and a blue tropical/floral print). I had a similar style suit from J.Crew last year with the same ruching on the bottom half and knew this one would be good for my body type. Medium was good on this one – note that this one is less cheeky than some of the others but I still like it! If you’re looking for a gingham suit but this one isn’t for you, try this one, which also fit really well. Yesterday’s 75 degree and sunny weather was a big tease, but I loved every second of it and it had me thinking about summer. 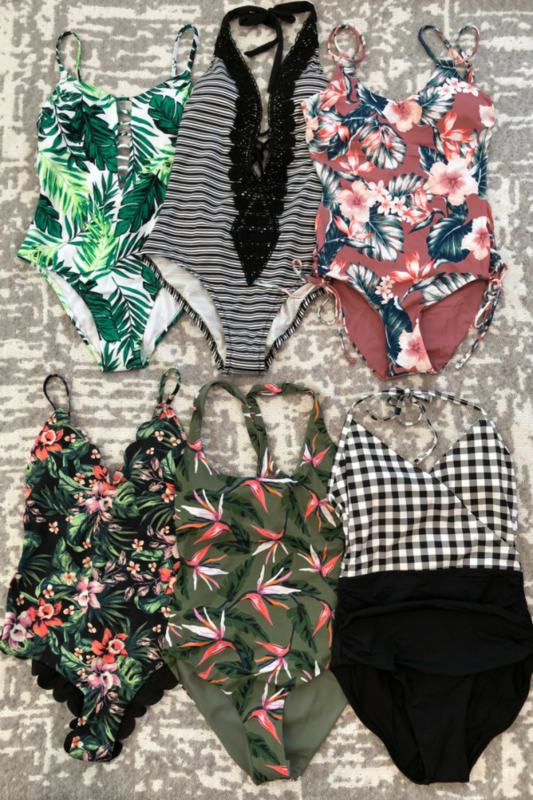 I was doing some online shopping this past weekend and found myself browsing one-piece swimsuits and decided to take the plunge and order a few to try on. I didn’t think I would end up liking them, but I figured the worst thing that would happen is they would go back to the store. Through high school, I was a competitive swimmer, so while I definitely wore a Speedo one-piece many times in my life, I never actually bought or wore a cute one. And now I’m obsessed. There are SO many good options available – all with fun details, such as strappy backs, cut outs, mesh and more. The best part is they come at all different price points. Since I’m a newbie to one-pieces, I want to see how much I end up wearing them before buying any of the more expensive options. So today I’m sharing my picks for one-pieces under $60 – many of which are even less! And right now, you can shop these using the links below and use code STYLE to get $5 off $35 or $15 off $75. What’s your favorite place to shop for swimsuits? Let us know in the comments below!